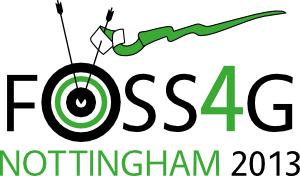 On Thursday 19th November, I attended the ‘Free and Open Source Software For GIS’ (FOSS4G) conference in Nottingham, UK with two of my colleagues from the Plantwise Knowledge Bank. The conference, organised by OSGeo, had the strapline “Geo For All” and aimed to show that the tools that this Geographic Information Systems (GIS) community is developing can be, and are being, used by people in many different areas of work. We were visiting the conference to get an update on what open source software is now available, and how other people are tailoring and combining these packages to suit their needs. The opening keynote address was from Chris Tucker of mapstory.org, a prototype that has been designed to help people map their data not just spatially but temporally. The idea behind this website is that you can understand more about data by seeing it in the context of time rather than looking at one snapshot on a static map. Following the keynote, we found out about the new features of QGIS v2.0, which has just been released. There are lots of new features including an improved print composer with ‘atlas generator’, which allows you to generate lots of similar maps in one go without having to write code. We also attended a talk on OpenPOIs, which is making points of interest freely available for use in GIS. We were interested to find out about this registry of POIs as it includes not only Geonames data (which we already use as a source of location information for our distribution data in the Knowledge Bank) but also data from other sources such as OpenStreetMap, making it a valuable one-stop-shop for POIs. A seminar on a wide area alerting and notification system that has been developed to report on wildfires in South Africa was interesting, particularly hearing about the logic developed so that fire managers weren’t alerted to the same fire multiple times. It is possible that some parts of this system could be applied to monitoring and reporting on the health of crops or even particular diseases on crops using satellite data. In the afternoon we attended several seminars on developing GIS for mobile. We heard about the developers’ issues and successes of using various GIS platforms for mobile. They had to take into consideration the trade-off between quality and performance of maps when displaying them on mobile devices, as high resolution maps require more storage space and take longer to load. There was also a success story of using OpenDataKit to design a data collection form and system for crowdsourcing photos of tourist sights. In the last session of the day we were given an overview of OSGeo Live 7.0 – the disc that we were given, which has full, working versions of many of the free geospatial software packages that we had heard about at the conference. The closing keynote was given by Ben Hennig from the University of Oxford, who works on the Worldmapper Project. He showed us some of the maps he has made as part of the project, which display countries in different sizes according to the data. For example, the map below shows cereal production per person for each country.